Trauma, the Greek word for “wound,” is the most common form of suffering in the world today. An inescapable part of living, the bad things that happen to us always leave aftereffects in both body and mind. While many people experience these aftereffects and move on, millions of others develop Post-Traumatic Stress Disorder (PTSD)--a painful, chronic, and debilitating barrier to happiness. Reclaiming Life after Trauma addresses both the physical and psychological expressions of PTSD, presenting an integrative, fast-acting, evidence-based, and drug-free path to recovery. Authors Daniel Mintie, LCSW, and Julie K. Staples, Ph.D., begin with an overview of PTSD and the ways in which it changes our bodies and minds. They present research findings on cognitive-behavioral therapy (CBT) and yoga, giving the reader insights into how these powerful modalities can counteract and reverse the physical and mental aftereffects of trauma. The authors provide a suite of simple, powerful, and easily learned tools readers can put to immediate use to reset their traumatized bodies and minds. On the physical side, they teach four Kundalini yoga techniques that address the hypervigilance, flashbacks, and insomnia characteristic of PTSD. On the psychological side, they present 25 powerful CBT tools that target the self-defeating beliefs, negative emotions, and self-sabotaging behaviors that accompany the disorder. Drawing on many years of clinical work and their experience administering the successful Integrative Trauma Recovery Program, the authors help readers understand PTSD as a mind-body disorder from which we can use our own minds and bodies to recover. Woven throughout the book are inspiring real-life accounts of PTSD recoveries showing how men and women of all ages have used these tools to reclaim their vitality, physical health, peace, and joy. Far from being simply the troubling aftereffects of trauma, PTSD symptoms frequently express our core values, resourcefulness, and commitment to survival. Our brains take any input they receive and create the output they determine to be most important to us. When we develop PTSD, our brains always create such symptoms for good reasons. Let’s look at a sample of these reasons, grouped under their particular symptom clusters. Do these lists help you begin to understand your brain’s rationale for producing such symptoms? This understanding is an essential first step to resetting the output your brain is currently providing. We’ll now share with you a Discovery tool designed to help drill down and identify your brain’s rational for producing PTSD symptoms. Step One: Take out your lab book, date this entry, and write down a symptom you’d like to analyze. How did you do with your own Discovery? Were you able to identify some benefits of your symptom and the nice things these benefits say about you? Sometimes recognizing the benefits of a troubling symptom can be challenging. If you find yourself getting stuck, you can approach the question in another way. Ask yourself, What would I have to give up if this symptom suddenly vanished? For example: If I was never again angry when I thought about being attacked, what else would go away? Possible answers might include: my identity as a victim or survivor, my interest in blaming my perpetrator, a community of angry fellow-victims. You might also struggle to find the good things a particular benefit says about you as a human being. It may help to ask yourself questions like, How does this benefit express my core values and beliefs? What does it say about how I care for myself and others? How does this benefit reflect my moral code and sense of justice? Using Discovery, many of our patients begin to experience a fundamental shift in perception. Instead of seeing symptoms solely as problems or defects, they begin to appreciate the wisdom these symptoms embody. Often this leads to patients being more compassionate with themselves and to reductions in feelings of shame, defectiveness, and inferiority. The 4 traumatized brain is actually pretty smart! Even when producing troubling symptoms it does amazing work promoting what it sees as the deep self-interests of the person who is feeding and housing it and thus keeping it alive. When we go into a store our brains become real-time calculators of price and benefit. Examining an item of clothing or a kitchen appliance, we weigh its price against the benefit we believe it will bring. If the benefit is greater than the price we may purchase the item; if not we’ll likely keep shopping. Precisely this reckoning is the next step in evaluating the wisdom Discovery reveals. Once we’ve identified the benefits of a symptom and the ways in which it expresses our core values we can consider the symptom’s cost. In addition we’ll add a numeric component to the equation to quantify and further clarify our perception of value. One number will express the appeal of the benefits, the other the weight of the price. Each will be a number between 0 and 100. We can think of the price number as units of payment, the benefit number as units of value. See figure 4.5 for how Alicia priced anxiety and figure 4.6 for how Benito priced isolating himself from others. After pricing, Alicia was shocked at the poor bargain she’d been making with herself for many years. Her initial impression was that the benefits of anxiety represented a “good deal.” After Pricing she became angry at being cheated for so long and her desire to crush her anxiety and relinquish its benefits became quite strong. Alicia was now a candidate for cognitive-behavioral therapy. She quickly reset her brain’s output (anxiety) using the tools we taught her and began to reclaim a life of peace, joy, and connection with others. Benito made the opposite decision. The emotional price he paid for physical/social/legal safety seemed a reasonably good bargain. Benito decided he didn’t want our help with this particular symptom at this time and our work with him went in another direction. Step One: Take out your lab book, date this entry, and write down any symptoms you’d like to price. Step Four: Add a number at the end of each list. How does your pricing structure look? Like Alicia, are there benefits that you’re purchasing at too high a price? Like Benito do some benefits look like a good bargain? The next chapter will teach you tools to walk away from habits of body and mind that have outworn their usefulness and no longer represent a “good bargain” in the big picture of your life. Daniel Mintie, LCSW, is a cognitive-behavioral therapist, researcher, and trainer with over 27 years’ experience healing trauma. 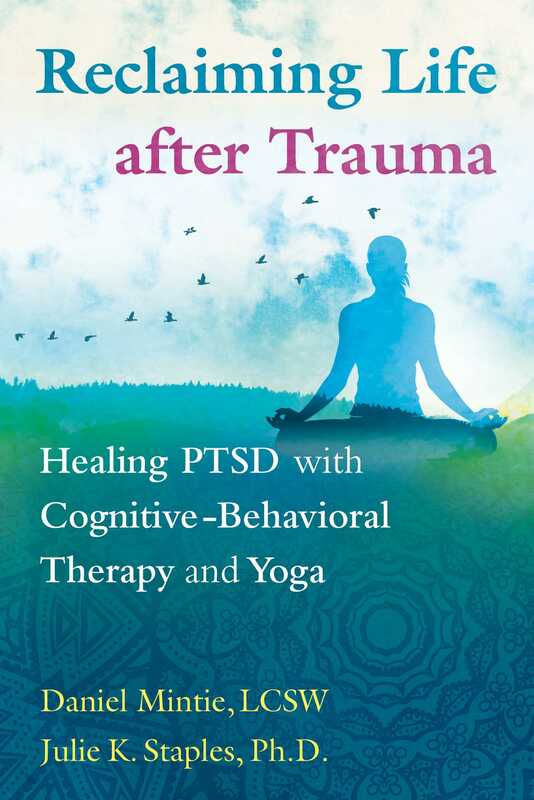 Along with Julie K. Staples, Ph.D., he developed an Integrative Trauma Recovery Program combining yoga and cognitive-behavioral therapy for healing PTSD. Daniel lives in New Mexico and conducts mind-body wellness workshops at universities and training centers worldwide. Julie K. Staples, Ph.D., is the Research Director at the Center for Mind-Body Medicine in Washington, D.C., adjunct Assistant Professor at Georgetown University, and a certified Kundalini yoga teacher. Along with Daniel Mintie, LCSW, she developed an Integrative Trauma Recovery Program combining yoga and cognitive-behavioral therapy for healing PTSD. Julie lives in New Mexico and conducts mind-body wellness workshops at universities and training centers worldwide. – Shanti Shanti Kaur Khalsa, Ph.D.